The Smithsonian National Museum of Natural History, located on the National Mall, was opened in 1910 exclusively to house the national collections and research facilities. Today, the Museum main building is 1.5 million square feet, houses over 1000 employees, and has collections facilities and research stations world wide. With a growing number of interactive websites, the Museum is evolving into a hub for national and international electronic education. There are over twenty online exhibits, each containing extensive topical information, histories of the Museum collection items referenced in each exhibit, virtual tours and other online interactives. Online information on traveling exhibits available for rent is also listed. The online Explore a Topic includes a collection of resources that explore topics such as the Earth and its history, the diversity of life, and Earth system science. Educator resources online include classroom activities and lesson plans on Measuring Biodiversity, evoking ideas of total number of unique things, such as genes, genera, and species, and their abundances. 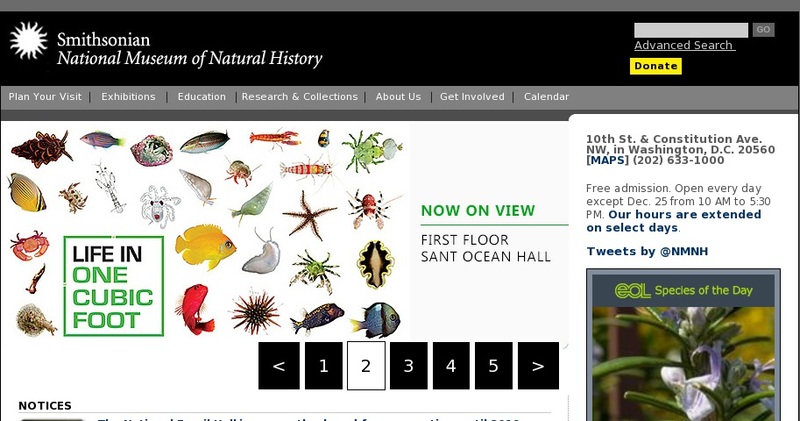 Science Departments include anthropology, botany, entomology, invertebrate zoology, mineral sciences, paleobiology and vertebrate zoology, many departments containing further online exhibits and searchable databases.